The Fair Wisconsin Leadership Awards and Gala Dinner is our annual signature event supporting Fair Wisconsin Education Fund. 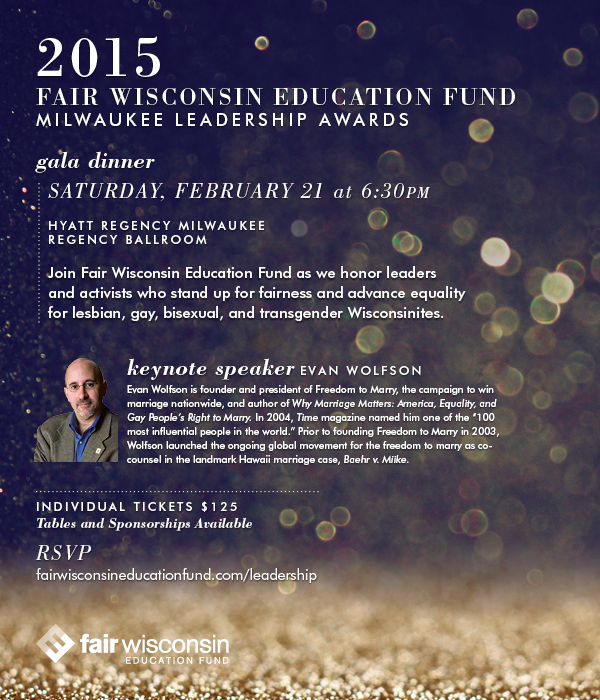 Each year Fair Wisconsin gathers members of the LGBT community, allies, activists and policy makers to recognize those who have made significant contributions to the advancement of LGBT equality in Wisconsin. Evan Wolfson is founder and president of Freedom to Marry, the campaign to win marriage nationwide, and author of Why Marriage Matters: America, Equality, and Gay People’s Right to Marry. In 2004, Time magazine named him one of the “100 most influential people in the world.” Prior to founding Freedom to Marry in 2003, Wolfson launched the ongoing global movement for the freedom to marry as co-counsel in the landmark Hawaii marriage case, Baehr v. Miike.